Contemporary information on mechanical ventilation (MV) use in emerging countries is limited. Moreover, most epidemiological studies on ventilatory support were carried out before significant developments, such as lung protective ventilation or broader application of non-invasive ventilation (NIV). We aimed to evaluate the clinical characteristics, outcomes and risk factors for hospital mortality and failure of NIV in patients requiring ventilatory support in Brazilian intensive care units (ICU). In a multicenter, prospective, cohort study, a total of 773 adult patients admitted to 45 ICUs over a two-month period requiring invasive ventilation or NIV for more than 24 hours were evaluated. Causes of ventilatory support, prior chronic health status and physiological data were assessed. Multivariate analysis was used to identifiy variables associated with hospital mortality and NIV failure. Invasive MV and NIV were used as initial ventilatory support in 622 (80%) and 151 (20%) patients. Failure with subsequent intubation occurred in 54% of NIV patients. The main reasons for ventilatory support were pneumonia (27%), neurologic disorders (19%) and non-pulmonary sepsis (12%). ICU and hospital mortality rates were 34% and 42%. Using the Berlin definition, acute respiratory distress syndrome (ARDS) was diagnosed in 31% of the patients with a hospital mortality of 52%. In the multivariate analysis, age (odds ratio (OR), 1.03; 95% confidence interval (CI), 1.01 to 1.03), comorbidities (OR, 2.30; 95% CI, 1.28 to 3.17), associated organ failures (OR, 1.12; 95% CI, 1.05 to 1.20), moderate (OR, 1.92; 95% CI, 1.10 to 3.35) to severe ARDS (OR, 2.12; 95% CI, 1.01 to 4.41), cumulative fluid balance over the first 72 h of ICU (OR, 2.44; 95% CI, 1.39 to 4.28), higher lactate (OR, 1.78; 95% CI, 1.27 to 2.50), invasive MV (OR, 2.67; 95% CI, 1.32 to 5.39) and NIV failure (OR, 3.95; 95% CI, 1.74 to 8.99) were independently associated with hospital mortality. The predictors of NIV failure were the severity of associated organ dysfunctions (OR, 1.20; 95% CI, 1.05 to 1.34), ARDS (OR, 2.31; 95% CI, 1.10 to 4.82) and positive fluid balance (OR, 2.09; 95% CI, 1.02 to 4.30). Current mortality of ventilated patients in Brazil is elevated. Implementation of judicious fluid therapy and a watchful use and monitoring of NIV patients are potential targets to improve outcomes in this setting. Acute respiratory failure is frequent and commonly a severe organ dysfunction occurring in the intensive care unit (ICU) . Under this circumstance, invasive or non-invasive mechanical ventilation (MV) are life-sustaining interventions . However, despite significant advances in ventilatory support , it remains associated with elevated mortality  and a significant impairment in the patients' quality of life in the post-ICU setting . Therefore, information about the epidemiological aspects of patients under MV is important from both clinical and health policy perspectives. However, most studies on the epidemiology of ventilatory support are outdated or were carried out before significant developments in the field, such as lung protective ventilation  or the widespread application of non-invasive mechanical ventilation (NIV) [7–9]. Moreover, these studies were usually carried out in high-income countries and very few contemporary data from emerging countries are available [10–12]. Specifically from Brazil, a previous trial evaluated the mortality of patients with acute respiratory failure. However, this study was a single center trial carried out only in a tertiary hospital and just included individuals with invasive mechanical ventilation and not patients under NIV . Comprehensive information about the clinical characteristics, outcomes and risk factors for mortality of these patients is essential to assist clinicians in the decision-making process and to allow better resource allocation. Therefore, we carried out a multicenter, observational cohort study in Brazilian ICUs to describe the clinical outcomes of patients submitted to ventilatory support as well as to identify variables associated with hospital mortality. The E pidemiology of R espiratory I nsufficiency in C ritical C are (ERICC) study was a multicenter prospective cohort study conducted in 45 Brazilian ICUs between 1 June 2011 and 31 July 2011. The study was coordinated by the Research and Education Institute from Hospital Sírio-Libanês, São Paulo and D'Or Institute for Research and Education, Rio de Janeiro. Invitations were sent to ICUs registered at the Brazilian Research in Intensive Care Network (BRICNet) database and 45 ICUs from 12 Brazilian states agreed to participate. Investigators and centers are listed at the acknowledgements section. The study was strictly observational and decisions related to patients' care were at the discretion of the attending ICU team. The study was approved by the institutional review board (IRB) at the coordinating center (Comitê de Ética em Pesquisa - CEPesq - approval number HSL 2010/51) and, subsequently, by the National Ethics Committee and local review boards at each participating site. The need for informed consent was waived or requested in some sites according to the local IRBs directives. Patients aged ≥ 18 years old requiring ventilatory support for > 24 h during the first 48 h of ICU admission at the participating ICUs were included in the study. In the subgroup of patients undergoing NIV, only those that used this modality for at least 6 h/day were included. Patients with a previous tracheostomy, admitted for routine uncomplicated postoperative care (ICU stay < 48 h), readmissions and those with terminal conditions were not considered. Demographic, clinical and laboratory data were collected during the ICU stay, including the main diagnosis for ICU admission, the reasons for and modality of ventilatory support (conventional MV or NIV), chronic health status, the Charlson Comorbidity Index , the need for vasopressors, dialysis, tracheostomy, the Simplified Acute Physiology Score 3 (SAPS 3)  and the Sequential Organ Failure Assessment (SOFA) score . Patients who first received NIV, irrespective of its duration, and subsequently required endotracheal intubation were considered as NIV failure. The cumulative fluid balance over the first 72 h of ICU stay was also calculated. Sepsis was diagnosed using the current definitions . The patient was considered to have an infection when there were clinical, laboratory, radiological and microbiological findings suggesting the presence of infection that justified the administration of antibiotics (excluding prophylaxis) . Acute respiratory distress syndrome (ARDS) was defined and classified according to the Berlin definition . The main outcome of interest in the current study was all cause in-hospital mortality. Data were collected using a web-based specific and standardized electronic case report form. Each investigator and research coordinator was provided access to the website, where all study documentation, including a comprehensive manual describing data collection requirements and variable definitions, was available. A central office was accessible through telephone and email contact to provide support to investigators. Local investigators were responsible for training local staff for data collection, supervising data collection, controlling for data completeness and quality. Data consistency was assessed through a rechecking procedure of a 5% random sample of patients. Data were screened in detail by three investigators (LCA, MS, MP) for missing information, implausible and outlying values, logical errors and insufficient details. In case of unconformity, local investigators were contacted to provide the requested information. Standard descriptive statistics were used to describe the study population. Continuous variables were reported as median (25% to 75% interquartile range, IQR). Univariate and multivariate analysis using a binary logistic regression were used to identify factors associated with the dependent variables (hospital mortality or NIV failure) . We also carried out analysis of SOFA score excluding the respiratory component to reduce interaction with ARDS in the multivariate analysis and to assess the severity of associated organ failures. Linearity between each continuous variable and the dependent variable was demonstrated using locally weighted scatterplot smoothing (LOWESS) . In case of nonlinearity, the variable was transformed or stratified according to the analysis of the functional form and clinical significance. For categorical variables with multiple levels, the reference level was attributed to the one with the lowest probability of the dependent variable. Variables yielding P- values < 0.2 by univariate analysis were entered in the multivariate analysis to estimate the independent association of each covariate with the dependent variable. Results were summarized as odds ratios (OR) and respective 95% confidence intervals (CI). Possible interactions were tested. Two-tailed P- values < 0.05 were considered statistically significant. The study flowchart is shown in Figure 1. A total of 773 patients fulfilled the eligibility criteria of the study and were therefore evaluated. Their main characteristics are depicted in Table 1. The most frequent diagnoses at ICU admission were pneumonia (27%), neurological diseases (19%), non-pulmonary sepsis (12%) and obstructive pulmonary disease (6%). Patients were admitted to the ICU at a median of one (zero to three) day after hospital admission. Median SAPS 3 score was 62 (52 to 72) points and the probability of death estimated by the global equation was 40 ± 24%. Using the customized equation for countries from Central and South America, the probability of death estimated by SAPS 3 was 52 ± 26%. Most patients (67%) used vasopressors during their stay in the ICU and 19% required renal replacement therapy (RRT). Abbreviations: AIDS, Acquired Immunodeficiency Syndrome; ARDS, Acute Respiratory Distress Syndrome; COPD, Chronic Obstructive Pulmonary Disease; ICU, Intensive care unit; LOS, Length-of-stay; MV, Mechanical ventilation; NIV, Non-invasive ventilation; PEEP, Positive End-Expiratory Pressure; RRT, Renal Replacement Therapy; SAPS, Simplified Acute Physiology Score; SOFA, Sequential Organ Failure Assessment. Invasive MV was initially used in 80% (n = 622) of the patients and NIV was used in the remaining 20% (n = 151) of the patients as the initial ventilatory support (Table 1 and Figure 2). Of the later, 81 (54%) patients failed NIV support and were subsequently intubated for invasive MV. Ventilatory modes used initially in patients who received invasive MV were pressure-controlled ventilation (n = 371, 60%), volume-controlled ventilation (n = 186, 30%), pressure-support ventilation (n = 54, 9%) and others (n = 11, 1%). Median tidal volume was 7.5 (6.1 to 8.7) mL/kg of predicted body weight and plateau pressures were below 30 cmH2O in the vast majority of the patients. 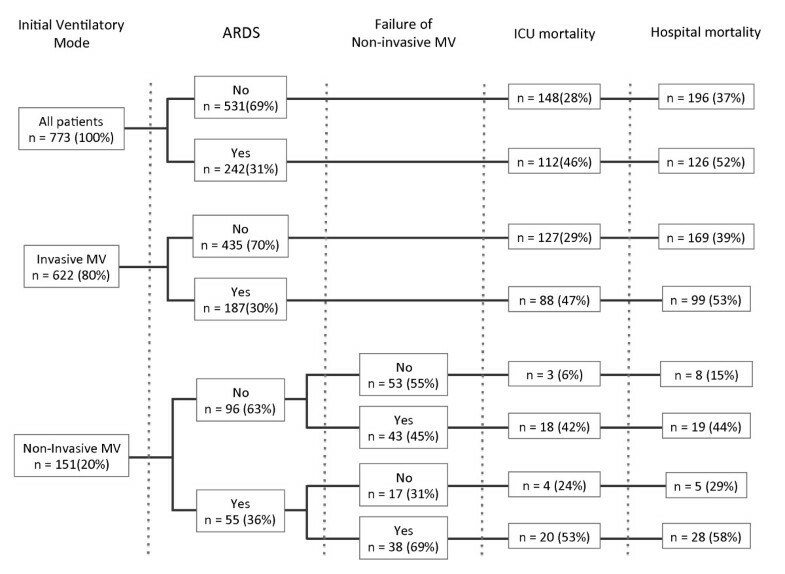 ICU and hospital mortality rates according to ventilatory support, ARDS diagnosis and NIV failure. ARDS, acute respiratory distress syndrome; ICU, intensive care unit; MV, mechanical ventilation. The overall ICU and hospital mortality rates were 34% and 42%, respectively (Figure 2 and Table 1). In the univariate analysis, age, ideal body weight, SOFA score at day 1, SAPS 3 score, Charlson comorbidity index, hospital length of stay before ICU, admission from the emergency room and from the operating room were associated with hospital mortality. Additionally, NIV failure, lower PaO2/FiO2 ratio, ARDS diagnosis, tracheostomy, duration of ventilatory support, need for vasopressors and renal replacement therapy (RRT), cumulative fluid balance and maximal blood lactate concentrations were also associated with hospital mortality (Table 1). In multivariate analysis, older age, higher SOFA scores (without respiratory component at Day 1), Charlson comorbidity index > 2, moderate to severe ARDS, NIV failure, use of invasive MV, higher lactate concentrations and both very negative or positive cumulative fluid balance over the first 72 hours of ICU stay were independently associated with increased hospital mortality (Table 2). Abbreviations: ARDS, Acute Respiratory Distress Syndrome; MV, Mechanical ventilation; NIV, Non-invasive ventilation; SOFA, Sequential Organ Failure Assessment Score. Area under receiver operating curve for predicted mortality (95% CI): 0.77 (0.73 to 0.81), P < 0.001. Hosmer-Lemeshow Χ2: 8.535, P = 0.383. ARDS was diagnosed in 242 (31%) patients (Figure 2). Of these, 77% were supported with invasive MV and 23% received NIV as the initial ventilatory support. The rate of NIV failure in ARDS patients was 69%, as compared to 45% in non-ARDS patients (P = 0.007). 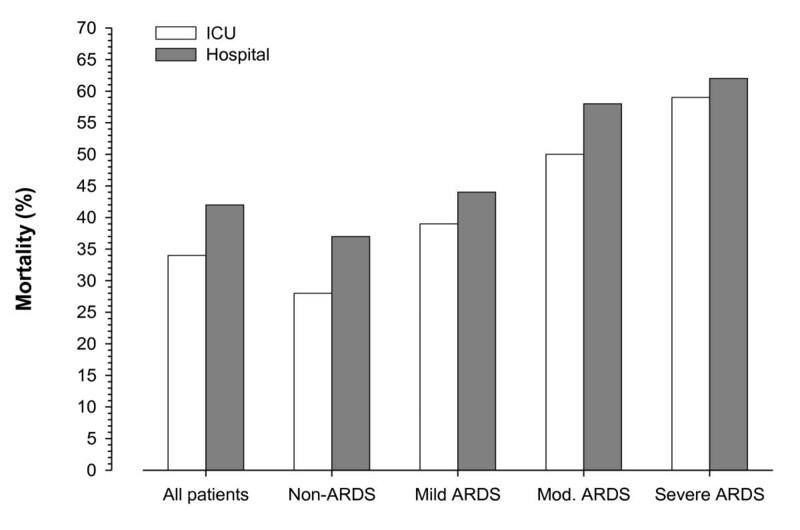 ICU and hospital mortality in the ARDS population was 46% and 52%, respectively (Figure 2). In Figure 3, we depicted the ICU and hospital mortality rates for each category of ARDS. The combined ICU mortality for ARDS moderate and severe (the former definition of ARDS ) was 55% and the hospital mortality was 60%. 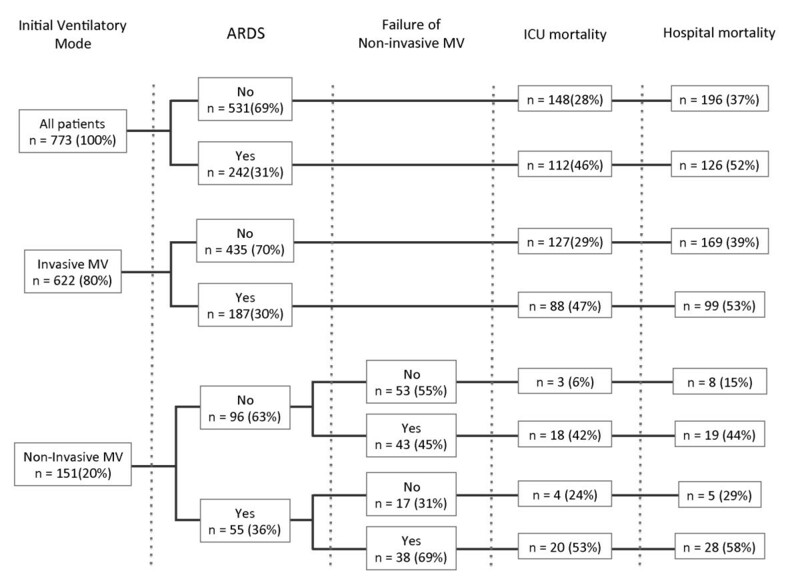 ICU and hospital mortality rates according to the Berlin definition of ARDS. P < 0.001 (Pearson Chi-square test) for the comparison of hospital mortality and ARDS classification. ARDS, acute respiratory distress syndrome; ICU, intensive care unit. The characteristics of patients that initially received NIV are shown in Table 3. The most common diagnoses were pneumonia (23%), neurologic disorders (21%) and non-pulmonary sepsis (12%). Classical indications for NIV, such as obstructive pulmonary disease and congestive heart failure, were present in only 5% and 8% of the cases, respectively. NIV failure occurred in 54% (81/151) of patients receiving NIV initially. Factors related to NIV failure in univariate analysis were total SOFA score, SOFA score excluding respiratory component, ARDS diagnosis, length of NIV, tracheostomy, use of vasopressors and a positive cumulative fluid balance. As expected, ICU and hospital lengths of stay and mortality were higher in patients who experienced NIV failure (Table 3). In multivariate analysis, a SOFA score without the respiratory component ≥ 4 points, a diagnosis of ARDS and a cumulative fluid balance higher than 2 L in the first 72 hours of ICU stay were associated with NIV failure (Table 3). 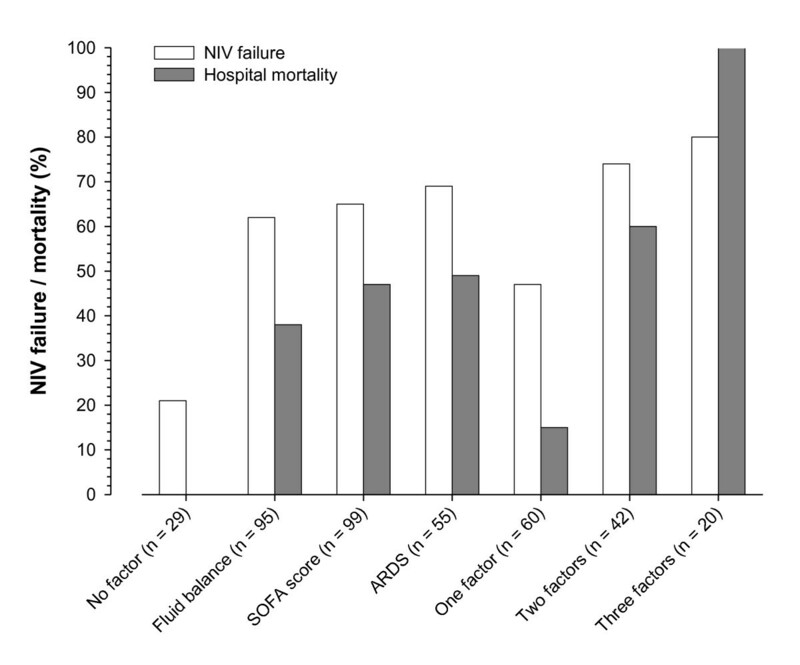 The frequency of NIV failure as well as hospital mortality increased significantly with the number of these risk factors presented by the patients (Figure 4). Data are expressed as median (p25 to p75) or number (%). Abbreviations: ARDS, Acute Respiratory Distress Syndrome; COPD, Chronic Obstructive Pulmonary Disease; LOS, Length-of-stay; NIV, Non-invasive ventilation; RRT, Renal Replacement Therapy; SAPS, Simplified Acute Physiology Score; SOFA, Sequential Organ Failure Assessment. Area under receiver operating curve for NIV failure (95% CI): 0.72 (0.64 to 0.80), P < 0.001. Hosmer-Lemeshow Χ2: 2.555, P = 0.768. Interaction of risk factors for failure of non-invasive ventilation and hospital mortality. Fluid balance denotes cumulative fluid balance ≥ 2 L in the first 72 hours of intensive care unit stay. SOFA score denotes Sequential Organ Failure Assessment punctuation ≥ 4 (excluding respiratory component). ARDS denotes Acute Respiratory Distress Syndrome. P < 0.001 (Pearson Chi-square test) for both the comparisons of hospital mortality and non-invasive ventilation failure and risk factors interaction. Table 4 depicts the variables related to weaning in our population. Carrying out a spontaneous breathing trial and a successful extubation were protective factors for mortality in the univariate analysis. Additionally, 30% of the patients that were successfully extubated received non-invasive ventilation after extubation. Weaning failure with subsequent reintubation occurred in 15% of the patients. Tracheostomy was carried out in 182 (29%) patients under invasive mechanical ventilation 7 (5 to 11) days after endotracheal intubation. In the present study, mortality rates of patients in Brazilian ICUs requiring ventilatory support were elevated, regardless of the underlying condition. Factors such as age, comorbidities, ARDS, disease severity and variables related to ICU support like positive fluid balance and NIV failure are independently associated with hospital mortality. We also observed that more than half of the patients receiving NIV as the primary modality of ventilatory support failed and required invasive mechanical ventilation subsequently. Variables independently associated with NIV failure were the severity of organ dysfunctions, the presence of ARDS and a positive fluid balance. The mortality rate of critically ill patients under ventilatory support and patients with ARDS is elevated in both observational and interventional studies [6, 21, 22]. In the last decade, however, important ventilatory interventions, such as lung protective strategies with reduction in tidal volumes  and widespread use of NIV , were more frequently incorporated in the clinical practice  and could have resulted in different mortality rates. Nevertheless, some recent studies showed very modest or no changes in these outcomes [2, 4, 9, 25]. In a systematic review by Phua et al., the pooled mortality rate of ARDS in observational studies was 48% and did not decrease significantly in the last years . More recently, Villar et al. reported a hospital mortality rate of 48% for ARDS patients under low tidal volume ventilation . We observed a higher mortality rate for the entire cohort and a more prominent rate for ARDS patients. However, our results are within the predicted mortality range of SAPS 3 and comparable to those reported in similar countries, such as Argentina . Possible explanations for our findings may include unequal access to healthcare [28, 29] as well as unmeasured factors related to the process of caring for these patients. There is a significant gap between the recommendations of low tidal volumes for ARDS patients and their adoption in practice. Several observational studies demonstrated the lack of adherence to this strategy [9, 30] and our study confirms these findings. Moreover, a recent meta-analysis suggests that even ventilated patients without ARDS may benefit from low tidal volumes . However, it is important also to emphasize that in this trial and similar to other studies, the majority of patients were ventilated with plateau pressures below the limit of 30 cmH20, which may partially compensate the harmful effects of high tidal volumes. In our study, more than 60% of the patients under invasive MV for more than 24 hours were submitted to a spontaneous breathing trial and 54% were extubated, which is similar to previous reports . Seventeen percent of the patients used NIV after extubation, an incidence also comparable to other studies . Tracheostomy was done in 29% percent of the patients in a median period of one week after initiation of MV. There is significant heterogeneity in the rates of tracheostomy in patients under MV as well as at the time of the procedure [9, 34–36]. 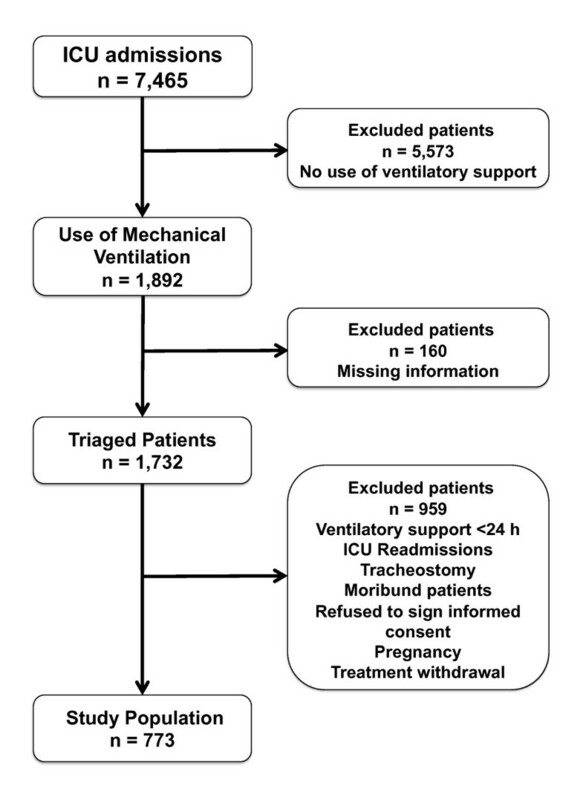 A previous one-day point-prevalence study of MV that included patients from Brazil showed that tracheostomy was done in 27% of the individuals in a median of 8 (1 to 15) days after ventilatory support . These numbers are similar to our report and to comparable countries such as Argentina, Chile and Uruguay . NIV was used as the first line of treatment for respiratory failure in 20% of the patients in our population, with a 54% failure rate. The failure rates for NIV are quite variable in the literature and seem to be related to the cause of respiratory failure and disease severity [23, 37, 38]. Elevated failure rates are worrisome since NIV failure has been previously associated with increased mortality risk  and, in this study, was an independent risk factor for mortality. We could speculate that misperception of disease severity by the multidisciplinary team may have contributed to over-utilization of NIV for high-risk patients, delaying invasive mechanical ventilation and contributing to the poor outcome of these patients. Another example of a potentially modifiable risk factor for mortality is related to the fluid strategy. A positive fluid balance is consistently associated with adverse outcomes in the ICU setting, mainly for patients with ARDS [40, 41] and acute kidney injury . We found that the extremes of cumulative fluid balance in the first three days are independently associated with hospital mortality. Interestingly, we also found that a positive fluid balance in the first days was associated with NIV failure. Our data suggest that, taking into account the hemodynamic status, a judicious fluid balance in the first days of ICU stay may be a safer goal in patients under ventilatory support. The present study has several shortcomings. First, it was carried out during the winter period in the Southern hemisphere, and this may have influenced the incidence of respiratory infections and also the occurrence of ARDS. However, the study was conducted between early June and the end of July and epidemiologic data demonstrate that both Influenza and other lower respiratory infections present a different seasonality varying according to the region of the country . We did not collect data on the origin and on the time of ARDS development, which precludes a more detailed evaluation of these patients. In addition, we used a convenience sample of ICUs that usually participate in clinical studies in Brazil and the sites that included patients are predominantly from the Southeast and Southern regions of the country, thus our data may not be representative of the entire nation. However, the concentration of hospitals from these regions is in accordance with a higher concentration of ICU beds and the healthcare system in Brazil . Considering that academic institutions and those participating in clinical studies usually have better organization and standards of care, it is possible that the actual mortality of mechanically ventilated patients may be even higher. Current mortality of mechanically ventilated patients in Brazil remains elevated. Implementation of judicious fluid therapy and a watchful use and monitoring of NIV patients are potential targets to improve outcomes in this setting. Contemporary information on mechanical ventilation use in emerging countries is limited. Moreover, most epidemiological studies on ventilatory support were carried out before significant developments, such as lung protective ventilation or widespread application of non-invasive ventilation. In mechanically ventilated patients in Brazil, factors such as age, comorbidities, ARDS, disease severity and variables related to ICU support, such as positive fluid balance and NIV failure, are independently related to hospital mortality. NIV failure occurred in 54% of the patients and was associated with the severity of organ dysfunctions, presence of ARDS and positive fluid balance. Current mortality of ventilated patients in Brazil is exceedingly high. Implementation of judicious fluid therapy and a watchful use and monitoring of NIV patients are potential targets to improve outcomes in this setting. This study was funded by the Research and Education Institute from Hospital Sírio-Libanês, São Paulo and the D'Or Institute for Research and Education, Rio de Janeiro. The study was supported by the Brazilian Research in Intensive Care Network (BRICNet). Dr. Azevedo had full access to all data in the study and takes responsibility for the integrity of the data and the accuracy of the data analysis. The authors would like to thank the following sites and investigators: Bahia: Hospital Espanhol - Salvador (Amadeu Martinez, Lívia Leal, Antonio Jorge Pereira). Distrito Federal: Hospital Santa Luzia - Brasilia (Marcelo de Oliveira Maia, José Aires Neto). Espírito Santo: Vitória Apart Hospital - Vitória (Claudio Piras), Centro Integrado de Atenção à Saude (CIAS) Unimed Vitória - Vitória (Eliana Bernadete Caser, Cora Lavigne Moreira), Hospital Meridional - Cariacica (Pablo Braga Gusman, Dyanne Moysés Dalcomune). Maranhão: UDI Hospital - São Luís (Alexandre Guilherme Ribeiro de Carvalho, Louise Aline Romão Gondim, Lívia Mariane Castelo Branco Reis) Minas Gerais: Hospital Madre Tereza - Belo Horizonte (Daniel da Cunha Ribeiro, Leonardo de Assis Simões, Rafaela Siqueira Campos, José Carlos Fernandez Versiani dos Anjos), Hospital Mater Dei - Belo Horizonte (Frederico Bruzzi Carvalho). Pará: Hospital Regional Público do Araguaia - Redenção (Rossine Ambrosio Alves, Lilian Batista Nunes). Paraná: Hospital do Trabalhador - Curitiba (Álvaro Réa-Neto, Mirella Cristine de Oliveira), Hospital Vita Batel - Curitiba (Álvaro Réa-Neto, Mirella Cristine de Oliveira), Hospital Universitario Cajuru - Curitiba (Álvaro Réa-Neto, Luana Tannous), Instituto de Neurologia de Curitiba (INC) - Curitiba (Álvaro Réa-Neto, Brenno Cardoso Gomes). Rio de Janeiro: Instituto Nacional de Câncer - Hospital do Câncer I - Rio de Janeiro (Vicente Cés de Souza Dantas), Hospital de Clínicas de Niterói - Niterói (Fernando Borges Rodriguez, Priscila Abelha); Hospital de Clínicas Mario Lioni - Duque de Caxias (Marcelo E. Lugarinho); Instituto de Pesquisa Clínica Evandro Chagas (IPEC) - Rio de Janeiro (Andre Japiassu), Hospital da Mulher Heloneida Studart - Rio de Janeiro (Hélder Konrad de Melo, Elton Afonso Lopes), Hospital Pasteur - Rio de Janeiro (Pedro Varaschin, Vicente Cés de Souza Dantas), Hospital São Lucas - Rio de Janeiro (Marcos Freitas Knibel, Micheli Ponte, Pedro Mendes de Azambuja Rodrigues), Hospital Pro-Cardiaco - Rio de Janeiro (Rubens Carmo Costa Filho, Felipe Saddy, Théia Forny Wanderley Castellões, Suzana Alves Silva), Nortecor Hospital de Clínica - Rio de Janeiro (Luiz Antonio Gomes Osorio, Dora Mannarino), Hospital Copa D'Or - Rio de Janeiro (Rodolfo Espinoza, Cassia Righy, Marcio Soares, Jorge Salluh, Lilian Tanaka, Daniel Aragão, Maria Eduarda Tavares, Maura Goncalves Pereira Kehdi). Roraima: Hospital Geral de Roraima - Boa Vista (Valéria Maria Campos Rezende, Roberto Carlos Cruz Carbonell). Rio Grande do Sul: Hospital Moinhos de Vento - Porto Alegre (Cassiano Teixeira, Roselaine Pinheiro de Oliveira, Juçara Gasparetto Maccari, Priscylla Souza Castro), Santa Casa de Misericórdia de Porto Alegre - Pavilhão Pereira Filho (Paula Berto, Patricia Schwarz); Santa Casa de Misericórdia de Porto Alegre - Hospital Santa Rita (André Peretti Torelly, Thiago Lisboa, Paula Berto, Edison Moraes). Santa Catarina: Hospital São José - Criciúma (Felipe Dal-Pizzol, Cristiane Tomasi Damiani, Cristiane Ritter). São Paulo: Hospital A. C. Camargo - São Paulo (Juliana Carvalho Ferreira, Ramon Teixeira Costa, Pedro Caruso); Fundação Pio XII - Hospital de Câncer de Barretos - Barretos (Cristina Prata Amendola, Amanda Maria R. R. de Oliveira, Ulysses V. A. Silva, Luciana Coelho Sanches, Rosana D. S. Almeida); Hospital Sírio Libanês - São Paulo (Luciano Cesar Azevedo, Marcelo Park, Guilherme Schettino), Hospital Israelita Albert Einstein - São Paulo (Murillo Santucci Assunção, Eliezer Silva), Hospital São Camilo Santana - São Paulo (Carlos Eduardo Barboza, Antonio Paulo Nassar Junior), Hospital São Camilo Pompéia - São Paulo (Antonio Paulo Nassar Junior), Hospital das Clinicas da Faculdade de Medicina da USP - UTI Disciplina Emergências Clinicas - São Paulo (Luciano Cesar Azevedo, Marcelo Park), Hospital das Clinicas da Faculdade de Medicina da USP - UTI Disciplina Emergências Cirurgicas - São Paulo (Paulo Fernando Guimarães Morando Marzocchi Tierno, Luis Marcelo Malbouisson, Lucas Oliveira), Hospital das Clinicas da Faculdade de Medicina da USP - UTI Disciplina Anestesiologia - São Paulo (Davi Cristovao), Hospital Ipiranga - Rede Amil - São Paulo (Manoel Leitão Neto, Ênio Rego, Fernanda Eugênia Fernandes), Hospital Do Coração - São Paulo (Marcelo Luz Pereira Romano, Alexandre Biasi Cavalcanti, Dalton de Souza Barros, Érica Aranha Suzumura, Karla Loureiro Meira, Gustavo Affonso de Oliveira), Hospital Estadual de Américo Brasiliense - Américo Brasiliense (Paula Menezes Luciano, Evelin Drociunas Pacheco), Hospital São Paulo da Universidade Federal de São Paulo - São Paulo (Bruno Franco Mazza, Flavia Ribeiro Machado, Elaine Ferreira), Hospital Universitário da Universidade de São Paulo - São Paulo (Ronaldo Batista dos Santos, Alexandra Siqueira Colombo, Antonio Carlos Nogueira, Juliana Baroni Fernandes, Raquel Siqueira Nóbrega, Barbara do C.S. Martins, Francisco Soriano), Hospital São Luiz Jardim Anália Franco - São Paulo (Rafaela Deczka Morsch, Andre Luiz Baptiston Nunes), Instituto do Câncer do Estado de São Paulo (ICESP) - São Paulo (Juliano Pinheiro de Almeida, Ludhmila Hajjar, Sílvia Moulin), Hospital e Maternidade São Luiz - Unidade Itaim - São Paulo (Fábio Poianas Giannini, Andre Luiz Baptiston Nunes). The authors declare they have no competing interests regarding the topic of this manuscript. All authors contributed significantly to this manuscript, including study conception (LCPA, MP, JIFS, GS, MS), data acquisition (all authors), data analysis and interpretation (LCPA, MP, MS, JIFS), drafting manuscript (LCPA, MS, JIFS), revising the manuscript for important intellectual content (all authors), and approval of the final copy (all authors).